Explanation: A wide, looping orbit brought Juno close to Jupiter on August 27. 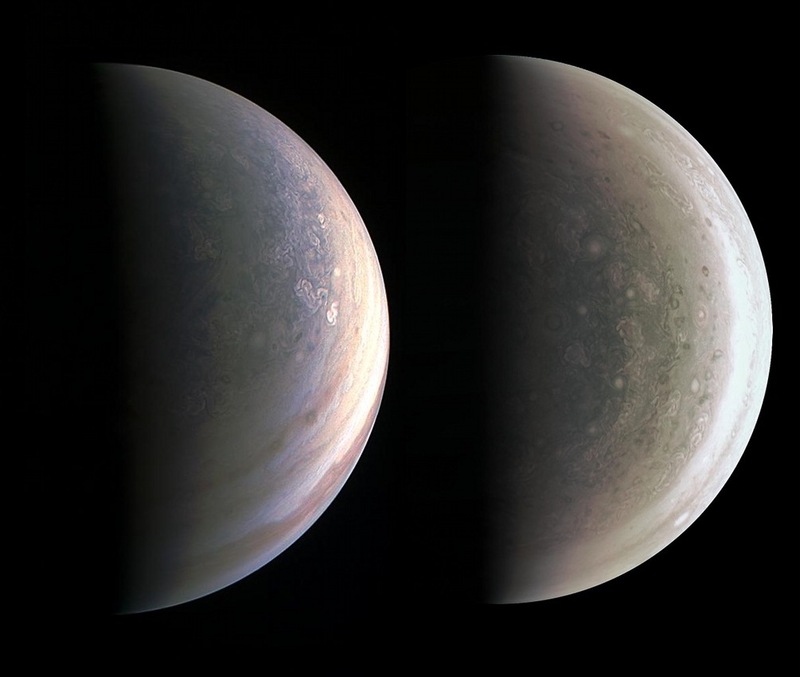 As the spacecraft swung around the giant planet's poles JunoCam acquired these premier direct polar views, a change from the usual nearly equatorial perspective of outbound spacecraft and the telescopes of planet Earth. The sunlit side of Jupiter's north polar region (left) was imaged about 125,000 kilometres from the cloud tops, two hours before Juno's closest approach. An hour after close approach the south polar region was captured from 94,500 kilometres away. Strikingly different from the alternating light-coloured zones and darker belts girdling more familiar equatorial regions, the polar region clouds appear more convoluted and mottled by many clockwise and counterclockwise rotating storm systems. Another 35 close orbital flybys are planned during the Juno mission.